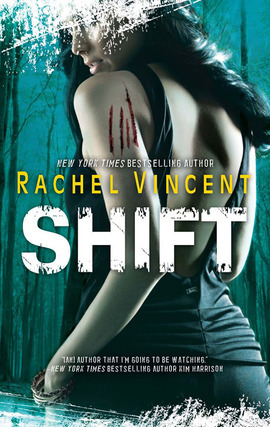 Shift by Rachel Vincent - WARNING! Shift is the fifth book in a series. I cannot review Shift without spoiling the other books in the series – especially big plot points in Prey, the fourth book. Do not read any further if you plan on reading this series and don’t want to be spoiled. With the body count rising and treachery everywhere, my instincts tell me to look before I leap. But sometimes a leap of faith is the only real option... From Goodreads. Shift is absolutely amazing! There is no nice introduction to this review as I can’t form one from being completely wowed by just how superb this book is! It’s unique, it’s a little creepy, it’s packed full of action, adrenaline, and emotion, and you know what I loved most? Just like all of Rachel Vincent’s Shifters novels, it’s clever. Those intricate little plot threads that were a big deal, but not so huge in the great scheme of things, all tie in later, and it’s just brilliant! Just when you think you’ve seen it all when it comes to the Shifters world, Rachel Vincent does it again and brings you something new – thunderbirds! I cannot tell you how creepy I found them! Sure, the werecats themselves could be seen as a little scary, but we know the characters now, we know their culture and their politics. We know there have are other weres in this world, as we came across a werebear in Pride, but their culture is at least known to the werecats. The thunderbirds are not only new to us, but they’re also fairly new to the werecats too – in that no-one has seen or heard of them in over 60 years. They’re huge, they’re vicious, and they have completely different rules to that of the werecats. And because of a misunderstanding, they’re after blood – the South Central Pride’s blood. And half-human, half-bird creatures look pretty freaky – at least in my head – when the thunderbirds are in partial shift. But they are brilliant! With the arrival of the thunderbirds, and the impending war with Calvin Malone and his allies, there is no time for the characters we love to properly grieve over Ethan’s death, and everyone is moving. Shift sees Faythe taking a bit more of a lead role in what happens than she’s used to – sometimes with the permission of her father, and sometimes without. Decisions need to be made, and Faythe has to make them, and they’re not always easy – especially as there are consequences to any path taken that could be detrimental to the Pride. Faythe shows incredible bravery, intelligence, and determination, and like in the other novels before, it’s hard not to be in awe of her. But as well as Pride problems on her shoulders, Faythe also has personal problems – and they’re much bigger than she realised. After she and Faythe gave in to their attraction through grief over Ethan’s death, she’s come to realise it wasn’t just grief induced lust, that she actually has a connection with Jace. The truth has to come out, and she has choices to make, and things will not be pretty for anyone involved. The action is incredible! The way these thunderbirds fight is just seriously gruesome; beaks and claws can do quite a lot of damage, and being fuelled by rage and the need for revenge leaves no room for restraint, and the thunderbirds really go for it. Bloody is an understatement, but exciting, and a little scary it is! The race against time to save the life of a loved one is immense, where every second is felt by all involved, with Faythe so tense, spontaneous self-combustion seems probable. It’s fantastic! I have literally just finished reading this book, and as much as I loved it, I’m a little sad that I read it so quick. There will only be one more book in series, Alpha, and it’s a testament to Rachel Vincent’s imagination, writing, and superb genius, that although I’m looking forward to reading it, I’m not looking forward to finishing it. Rachel will obviously be writing other books, for her Soul Screamers series and another adult series she’ll be starting, but it will be the end of Faythe and the South Central Pride, and I’m really not looking forward to saying goodbye. Alpha will be released 1st October, and as excited as I am to read about the fallout of Faythe’s personal problems, and what will happen to the Pride in the civil war, I’m glad I have to wait. This book, this whole series is absolutely incredible. I’ve said it before, and I’ll say it again; if there’s one series you have to read in your lifetime, the Shifters series is it.